Unlike Landsat images, Sentinel-2 datasets do not include thermal and Quality Assessment bands that simplify the detection of clouds avoiding erroneous classification. Moreover, also clouds shadows on the ground lead to anomalous reflectance values which have to be taken into account during the image processing. To date, only a specific module for Landsat automatic cloud coverage assessment is available within GRASS GIS (i.landsat.acca) while regarding shadows, no specific module is available. Therefore to date, the detection of clouds and shadows has to be manually performed for Sentinel-2 images. The aim is the coding of a specific module for GRASS GIS application which implements an automatic procedure for clouds and shadow detection within Sentinel 2 images. The module has to provide a tool which can be easily used by inexpert users, taking advantage of the suggested parameters, or by more expert users that can modify default values according to their needs. After being accepted as a student for GSoC 2018, I introduced my self in SOC and grass-dev lists on 24th of April (0). At the same time, I got in contact with my mentors, Moritz Lennert and Roberto Marzocchi. I corresponded with them by email more or less every day from the beginning to the end of the bonding period describing all the activities that I was carrying out (0)(1). I asked them suggestions about the best tool to set-up my dev environment, how to do that, etc. I also better detailed my proposal explaining to them the starting point of the project, the procedure, the algorithm and I asked them for hints and feedback. I shared immediately with them and the grass-dev list all the necessary information and all the new features like links to the wiki page, GitHub repository, schemas and description of the project, etc. I requested my OSGeo user ID on 26th of April and, once received, I created my project wiki page (2) and added the link to the GSoC 2018 Accepted proposals page (3). The wiki page includes: General information about the project (title, mentors, links to the proposal and GitHub repository, etc. ); A brief description of the project; Link to general and detailed schemas of the procedure to better describe the whole workflow; Goal; Timeline of tasks and deliverables. After discussing with my mentors, I have better detailed the timeline adding specific tasks for each week and the deliverables for the evaluations. I will keep my wiki page constantly up to date and I’ll add weekly reports following the instructions in the GSoC Recommendations for Student page (4). I chose GitHub as a public repository for the development of the GRASS GIS module for the automatic detection of cloud and shadow in Sentinel 2 images, under the guidance of my mentors. I studied the GitHub documentation (5) and followed tutorials (6) in order to understand how it works and how to use it. After that, I set up my GitHub repository (7) and I started committing some test files. I added the link to the GSoC 2018 Accepted proposals page (3), to my wiki page (2) and I shared it with my mentors and the dev community. My repository is licensed under the GNU General Public License v3.0, according to the licence of GRASS GIS. I requested the write access to the GRASS-Addons-SVN repository following the official procedure and now I have been added to the grass-addons contributors' list. This step was necessary to submit the code as a GRASS GIS addon at the end of the GSoC 2018. I checked and updated my developer environment and installed all the necessary libraries and dependencies so as to be ready to start coding after the bonding period. During the bonding period, I took lots of time to get familiar with GRASS Python scripting library and the writing of a GRASS module. First of all, I started from the community practices about how to contribute to GRASS GIS (8). Then I studied technical issues like function definition following the official documentation of GRASS Python scripting library (9). I also investigated the existing scripts (10)(11) to better understand how they work and how to structure addon code. During this phase, I made some coding tests that I shared with my mentors and the dev community through my repository. 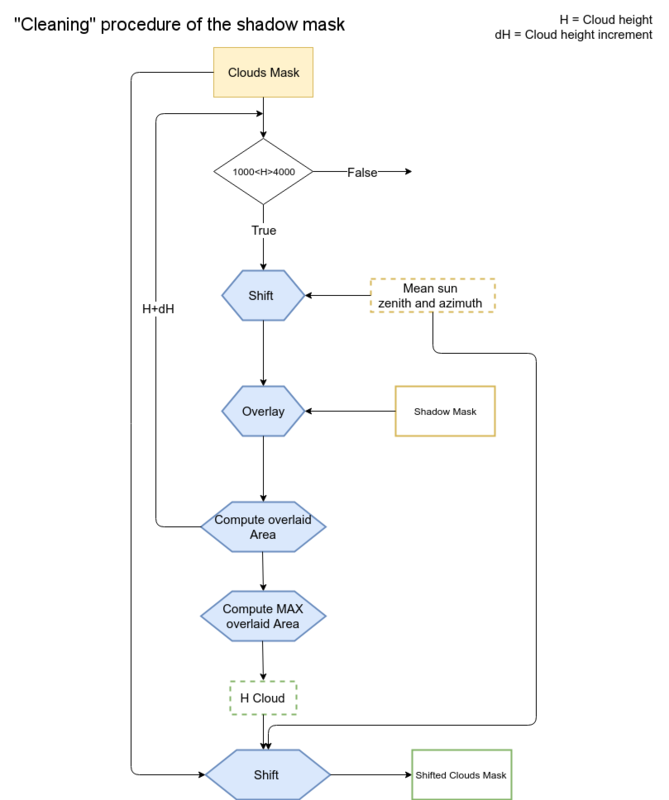 In order to better explain and define all the steps and procedures of the algorithm to be implemented as a GRASS addon, I elaborate a general workflow schema and specific diagrams for each procedure (cloud detection, shadow detection, etc.) (12). For the proper and complete consultation of the schemas, please use the google drive app diagram.io. Obviously, I shared everything with my mentors and the dev community. I started a new thread on the list adding all the necessary and useful links (wiki, repository, schema and full description of the project) and asking explicitly for feedback and hints (13). Since my progress has been a bit faster than expected I have already discussed with my mentors about further additions to the project. Therefore I have already updated my wiki page changing the timeline. In this way, I will be able to release a more complete module. 1) What did I complete this week? Unfortunately, I wasn't able to code on Thursday because of a PhD meeting with my supervisor. 2) What am I going to achieve for next week? 3) Is there any blocking issue? Unfortunately, I wasn't able to code for two days because of some commitments related to the PhD. No at the moment but the coding of the routine takes more time than expected. No at the moment even though I'm a little late on the roadmap because the coding of the routine to compute AOT took slightly more time than expected. No at the moment even though I'm a little late on the roadmap because also the implementation of the GUI took slightly more time than expected (made some changes to the code depending on the GUI requirements). Unfortunately, I wasn't able for two days because of an unexpected personal commitment. The title of the project is "GRASS GIS module for Sentinel-2 cloud and shadow detection". It adds new tools for the processing of Sentinel 2 images to GRASS GIS software (Organization: OSGeo). Optical sensors are unable to penetrate clouds leading to related anomalous reflectance values. Unlike Landsat images, Sentinel 2 datasets do not include thermal and Quality Assessment bands that simplify the detection of clouds avoiding erroneous classification. At the same time, also clouds shadows on the ground lead to anomalous reflectance values which have to be taken into account during the image processing. 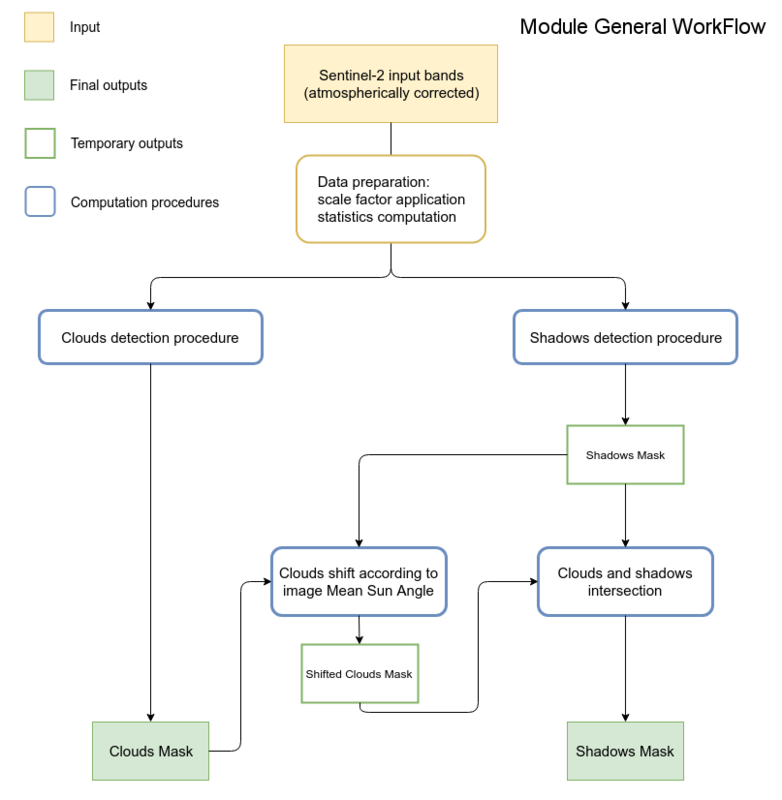 The project creates a specific module for GRASS GIS application (i.sentinel.mask) which implements an automatic procedure for clouds and shadows detection for Sentinel 2 images. 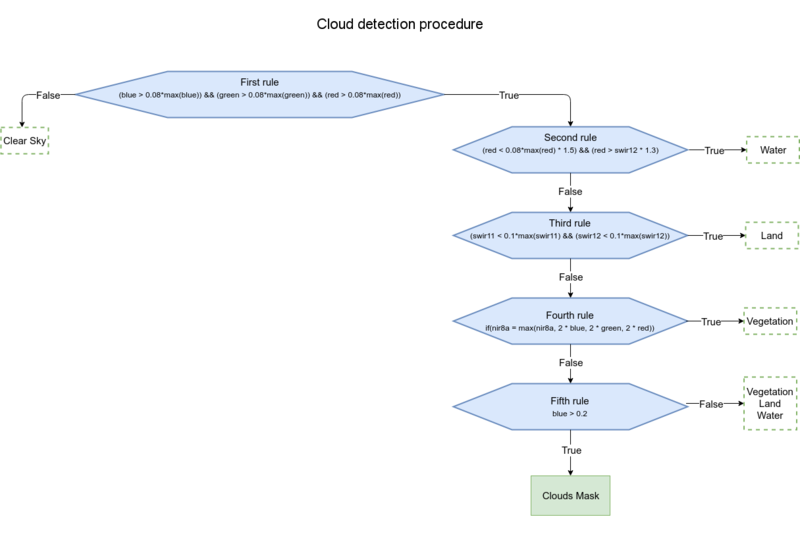 The procedure is based on an algorithm, developed within my PhD research, which allows to automatically identify clouds and their shadows applying some rules on reflectance values (values thresholds, comparisons between bands, etc.). These have been defined starting from rules found in literature and conveniently refined. In order to increase the accuracy of the final results, a control check is implemented. Clouds and shadows are spatially intersected in order to remove misclassified areas. The final outputs are two different vector maps (OGR standard formats), one for clouds and one for shadows. To run i.sentinel.mask, the bands of the desired Sentinel 2 images have to be imported and the atmospheric correction has to be applied. In order to make the data preparation easier, another GRASS GIS addon module has been developed within the GSoC project. i.sentinel.preproc is a module for the preprocessing of Sentinel 2 images (Level-1C Single Tile product) which wraps the import and the atmospheric correction using respectively two existing GRASS GIS modules, i.sentinel.import and i.atcorr. Before this GSoC 2018 project, no modules for the detection of clouds and shadows were available for Sentinel 2 images. 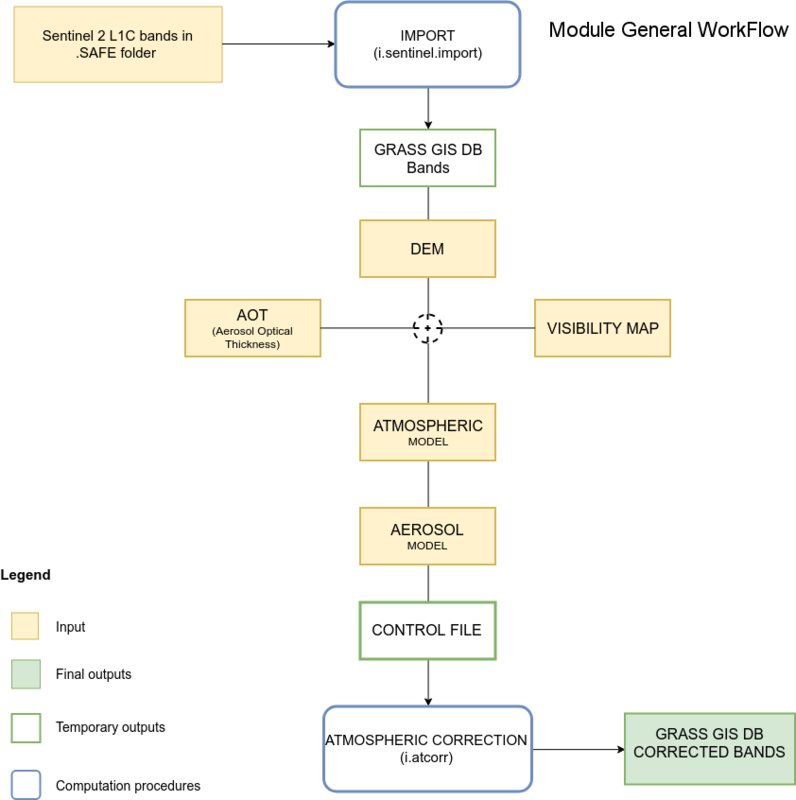 Only a specific module for Landsat automatic cloud coverage assessment was available within GRASS GIS (i.landsat.acca) while regarding shadows, no specific module was available. Moreover, performing the atmospheric correction was a bit complicated especially for unexperienced users who have to process one band at a time and provide all input parameters manually. Now a specific module for clouds and shadows detection, i.sentinel.mask, is available in GRASS GIS. Moreover, i.sentinel.preproc provides a simplified module which allows importing images and performing the atmospheric correction avoiding users to supply all the required input parameters manually. The module should help users in preparing data to use as input for i.sentinel.mask. In fact, it makes especially the atmospheric correction procedure easier and faster because it allows performing atmospheric correction of all bands of a Sentinel 2 scene with a single process and it retrieves most of the required input parameters from the image itself. Moreover, one of the possible output of i.sentinel.preproc is a text file to be used as input for i.sentinel.mask. Both i.sentinel.mask and i.sentinel.preproc are complete and working modules which can be easily installed with g.extension from the official GRASS GIS SVN repository. 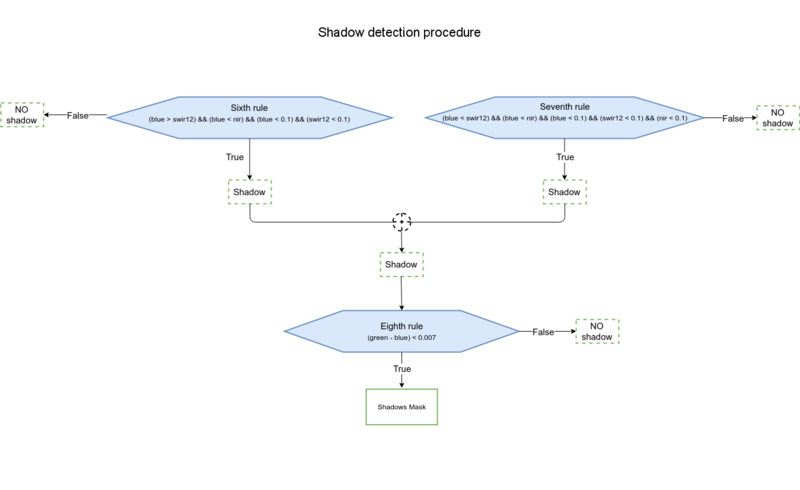 NOTE: Implementation of other existing algorithms of clouds and shadows detection was one of the possible goals of the GSoC project but the coding and debugging of some parts of the two addons required more time than expected.